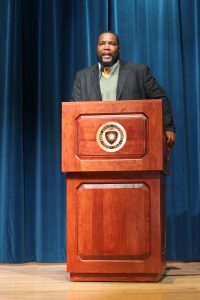 Dr. #Umar Johnson spoke, and at some points yelled to an audience that filled roughly half of the KIVA on Monday. Johnson is known just as much for his pro-black activism as he is for his negative characterizations of the #LGBTQ community. In radio and television talk shows, Johnson characterizes homosexuality as a curable mental disorder. Concerned students from #Kent State gathered outside the KIVA in a silent demonstration against Johnson and his presence in Kent. Kayden Maclay was involved in planning the demonstration. 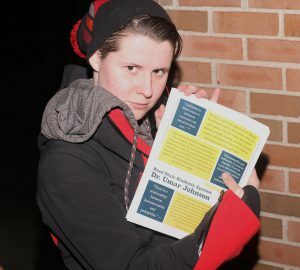 Kayden Maclay distributes fliers with controversial quotes from Dr. Johnson. Maclay cited Gabrielle Cooper with bringing Johnson’s talk to the attention of concerned individuals at Kent and for getting people inspired to react. Cooper and Maclay also helped create signs for the demonstration. Dr. Amoaba Gooden is the faculty advisor for the League of Conscious Knowledge Seekers (LOCKS), the student organization that brought Johnson to campus. Gooden arrived roughly one hour before Johnson began speaking. 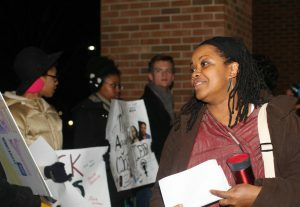 After meeting with friends and colleagues inside the KIVA, Gooden walked outside and greeted the demonstrators thanking them for their demonstration. When asked about her reaction to the demonstrators Gooden said, “this is the place for this to happen.” She was glad to see the demonstrators and emphasized the importance of an inclusive community. Kent graduates Matthew Cox and Nathan Williams attended the event. Williams said he “understands the [demonstrators’] signs.” When asked about his opinion of Johnson, Williams referred to a video interview of Johnson on The Breakfast Club, a talk radio show on 105.1 FM, in which Johnson discusses his views about people not being born gay. 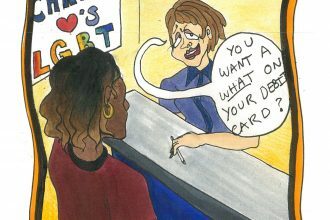 In this video, Johnson explains that lesbians become homosexual because they are terrified of black men, they have seen black men beat their mothers or they have been hurt or raped by black men. 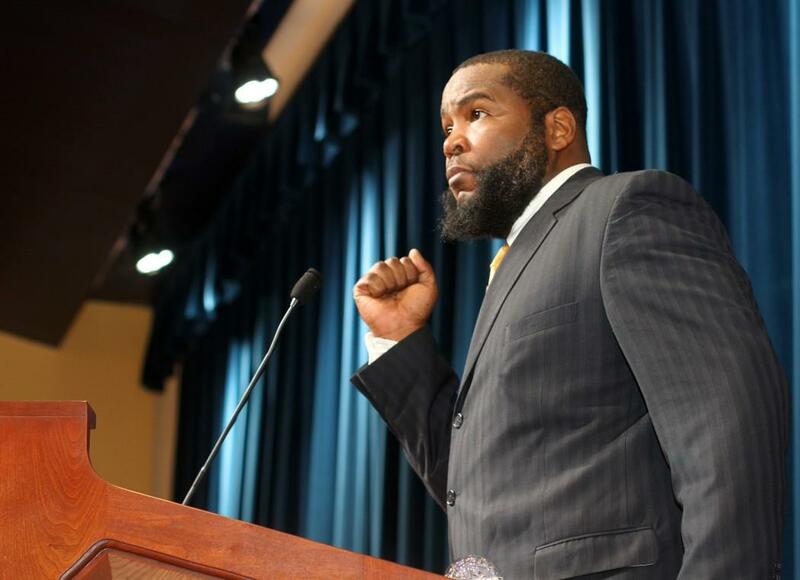 Dr. Umar Johnson speaking passionately Monday, February 8th in the KIVA. In the same video, Johnson claims that men become gay when their fathers are not present. He believes this lack of a male figure creates such a longing for male attraction that these men decide to date and have sexual relations with other men in order to fill the void left by their father. Fr. zoology major Jordin Manning holds a sign during the demonstration against Dr. Umar Johnson. Manning believes Johnson’s response was incomplete and evasive. She especially took issue with his claim that LGTBQ people have never been systematically dehumanized and oppressed. Even though strides have been made with the legalization of gay marriage, according to the Human Rights Campaign (HRC) it is still legal in 28 states for a person to be fired simply for being gay. In 20 states, if a gay person is assaulted it is seen as an assault and not a hate crime. Race is covered under the employment and hate crime laws in every state. Manning explains that even though LGBTQ oppression is not the same as black oppression, it does still happen. She used the term “cumulative oppression” to explain the black LGBTQ struggle. Cumulative oppression indicates the oppression is accumulating because one is a member of more than one oppressed group. Manning exemplifies this by being both black and gay. Sophomore public relations major Emmanuel Jackson briefly attended the event but left early due to a schedule conflict. When asked if he would stay if he could, Jackson responded with a resounding “No.” He cited Johnson’s reputation as “sexist, misogynistic and homophobic,” and his rhetoric as “more problematic than beneficial” to the black community. Not all audience members were dissatisfied with Johnson’s talk. Freshman journalism major and active member of Black United Students (BUS) Dartalia Alati believes Johnson “said what the black community wanted to hear.” She says it’s very important to have controversial speakers on campus because the reaction can say more about an issue than a speaker ever could. Alati was not aware of the $3,000 Kent paid Johnson through Undergraduate Student Government (USG). Jackson was aware Johnson was paid but was “disappointed with the payment” because it comes out of a fee included in tuition. Alati believes that there should be some way for students to opt out of paying for a speaker they do not agree with. 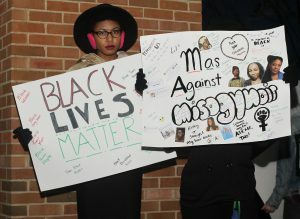 Johnson did however criticize the demonstrators, deeming some of the quotes on their signs inaccurate or out of context. He did not specify which ones. When asked to validate his credentials, Johnson said “I don’t do dates.” He said people can believe him or not, but maintained he is correctly certified. Johnson claims the rumor that he is not properly credentialed was started by “someone in [his] community, the black community,” who disagrees with his views.